The Chinese state-owned aerospace company, Comac, has rolled out a new twin-engined, narrow bodied airliner, the C919, many of whose components are sourced from the US and Europe. What is the wider significance of this? Comac has entered the single-aisle aircraft market, and within it are a number of components sourced from companies outside of China. We sought your opinions on the significance of this and just under half (46%) agreed that those companies should be wary of counterfeiting by outfits within China. Interestingly, a fifth of respondents thought the introduction of the C919 marks the beginning of the end Airbus and Boeing’s duopoly, and 24% were divided equally in the belief that the new aircraft presents a significant trade opportunity, and that its too early in the aircrafts’ development to signal any concerns. 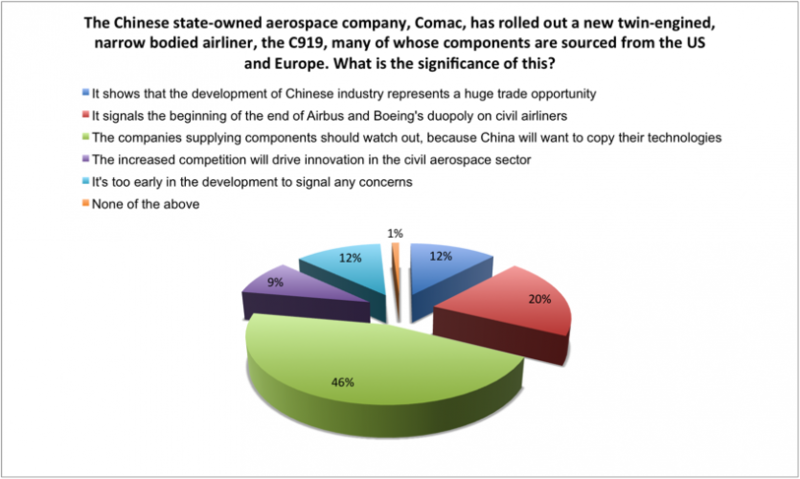 Less than a tenth (9%) thought the C919 would drive innovation in civil aerospace, and the remaining 1% did not agree with any of the options presented. In 1970 (yes that long ago) I wrote a ‘paper’ for the British Textile Machinery Association/British Textile Confederation. I pointed out that selling the very latest (self-operating) textile machinery around the world to countries, who at that time relied heavily on traditional ‘operative’ doffed’ and donned (removing ‘full packages, replacing them with empty ones) was a recipe to eventually remove the entire UK, European and US based textile manufacturing industry. Add to that, the sheer unadulterated greed of the retail trade (and the fact that its much more fun as a buyer flying to Bangkok than taking the train to either Leicester or Bradford…) and the demise of UK (Textiles/clothing) plc (and all its suppliers -fibre producers, machinery builders, etc) was only matter of time. It is inevitable that China will copy…..why would change now! I would not want to fly on a China designed and built aircraft until it had been proven over may thousands of flying hours in real service, not tests. Why? Remember that poor lady who lost here life and very nearly that of her child when an escalator cover moved and she dropped in to the works. If they can’t engineer something relatively simple how do they expect us to trust an aircraft they build? In my opinion we shouldn’t be dealing with China at all until it reforms from it’s poor human rights record and wholesale exploitation of it’s people. I don’t think it’s disputed that their workers work long hours 7 days aweek with little reward and seldon are allowed and form of relief. This is therefore basically a slave economy. Unfortunately many companies including my own are investiing in China for one reason only but to exploit this situation. If we continue to let China grow in this fashion this could ring the death bells of European and North American economies, not to mention many other democrocies around the world. I hesitate to disagree with John Wood over China since its ten years since I was last there: but I have to say that my visit(s) to (and its admitted only textile) manufacturing firms gave an impression of a well educated mostly young female work-force, who (first generation ex-farms and villages) seemed to be happy, well-looked after well-trained and competant. Most importantly, they looked me -a visitor- in the eye: wanted to know why I was there and were pleased that I was bringing an increase in their knowledge. Members of the organisers of the Shanghai Trade Show I had attended were courteous, well mannered, and extremely respectful and gracious in their kindness to an ‘outsider’. I was actually interviewed for the area TV : and described China as caring, competent, courteous. Since that visit, I have maintained contact with several students (one a fellow GamesMaker at ‘our’ Olympic Games in 2012) who were studying Engineering, Business, management at several UK Universities. They too (clearly from the intelligencia) come across as persons who are developing good careers, social lives, have the funds and opportunity able to travel abroad on vacations and for business. Several have stayed with us: one with her parents who had just retired. [At age 60!] I did not gain any impression of a society being ‘kept’ down by force: though of course I too read and see what the meja offers as the reality? (A slave society?-not really?) Education to every level appears to be the goal of all parents for their child (a singleton no more) and medical care, social services, and so on seemed to be as acceptable as is possible for 1.2 billion lives: who are at most two generations from the catastrophie of almost permanent (500 + years) of civil war or invasion. Capitalism is alive and well in China: indeed it is my belief that it was never really absent, even through the worst excesses of Mao: I do recall one comment of that era: to the effect that the first thing that those who were at last taught and able to read and write…did was to wtite to Mao to tell him so! Greatest good to greatest number? -a definition of good government? Voltaire would surely have approved. Since that visit, I have maintained contact with several students (one a fellow GamesMaker at ‘our’ Olympic Games in 2012) who were studying Engineering, Business, management at several UK Universities. One who I taught at Exeter actually married one of my colleagues! They too (clearly from the intelligencia) come across as persons who are developing good careers, social lives, have the funds and opportunity to travel abroad on vacations and for business. Several have stayed with us: one with her parents who had just retired. [At age 60! Her father had been the personal driver to the CEO of the Chinese equivalent/link to a well known European Oil Company which has a sea-side object as its Logo!] I did not gain any impression of a society being ‘kept’ down by force: though of course I too read and see what the meja offers as the reality? (A slave society?-not really?) Education to every level appears to be the goal of all parents for their child (a singleton no more) and medical care, social services, and so on seemed to be as acceptable as is possible for 1.2 billion lives: who are at most two generations from the catastrophie of almost permanent (500 + years) of civil war or invasion. Capitalism is alive and well in China: indeed it is my belief that it was never really absent, even through the worst excesses of Mao. I do recall one comment of that era: to the effect that the first thing that those who were at last taught and able to read and write…did was to wtite to Mao to tell him so! Greatest good to greatest number? -a definition of good government? Voltaire would surely have approved. I am glad to have the edge of my comments taken off by Mike and like to think that matters there are better than it may seem from what I have read and what is in the media. I’m not the best educated man and not well travelled as Mike seems to be and he probably knows better. However Europe and North America are not on a level playing field with China with its totalitarian government and are destined to lose the trade battle, if not lost already. Regarding how China is, and was recently, one good book to read would be Silent Tears by Kay Bratt how she assisted in a Chinese orphanage. It may be off the mark from this topic, but doe’s tell the tales of wo of how the disadvantaged suffer in Chinese society. “destined to lose the trade battle”: at its simplest John, its not ‘trade battles’ which concern me, but physical ones! “No, but the leadership wants to supply it!” Klaus looked at LS who was deeply interested in the conversation. “The Soviet Centre wants control of everything, just like the Tsars did before they were removed. They believe that the way to do so is to allocate resources to specific areas of the economy. Each Soviet Five-year Plan demands it.” Klaus continued. “Last year it was tractors, the year before machine tools: next year its clothing. Did you know next year is the 100th anniversary of the birth of Lenin?” He paused again. “I remember meeting the great man, and he was great, believe me. In the late 1920s I sold him tractors you know. Met him in person in the Kremlin and then at his dacha.” Klaus looked at LS, then at me with an intensity I found surprising. I was surprised to hear Klaus talk about the need to keep the media sweet. I had been brought up on a diet of jeer, sneer and smear by Western commentators and particularly in the States, about the Soviets. I had believed that all information was State controlled. I said so. I laughed out loud. Here was a man who knew the Soviets and the reality of the life and country to which I was being asked to go.